I am missing a tooth. What are my treatment options? Traditionally, before dental implants were invented in the 1980s, a missing tooth was replaced with a bridge, which was a unit of fake teeth that was cemented to adjacent teeth. Alternatively, a removable set of fake teeth (also known as a “partial denture”) was used, which had to be taken out at night and often showed metal clasps around other teeth for support. These choices (or “prostheses”) may still be used today, but the major disadvantage of these options are that adjacent and other teeth need to be shaved down to create space for the fake teeth to have support. When dental implants arrived in the 1980s, it was revolutionary since other teeth did not have to be affected. If your adjacent teeth were perfectly fine, you could have a simple surgery to have an implant placed in the missing space. This implant could then act as an anchor and hold a fake crown (or “cap”). Since then, there have been significant developments in implant technology, as these implants are now stronger and more versatile than ever. Today, with nearly 40 years of data, implant success rates generally hover around 95-98% universally. With implants, the jaw will provide the same level of stability to your replacement tooth that it did to your natural one. Our patients appreciate how durable this solution is and how it allows them to maintain an active lifestyle while eating all their favorite foods. Getting Dental Implants — What are Dental Implants? If you are missing a tooth, replacing the missing space with a dental implant is a popular and terrific choice that feels natural. 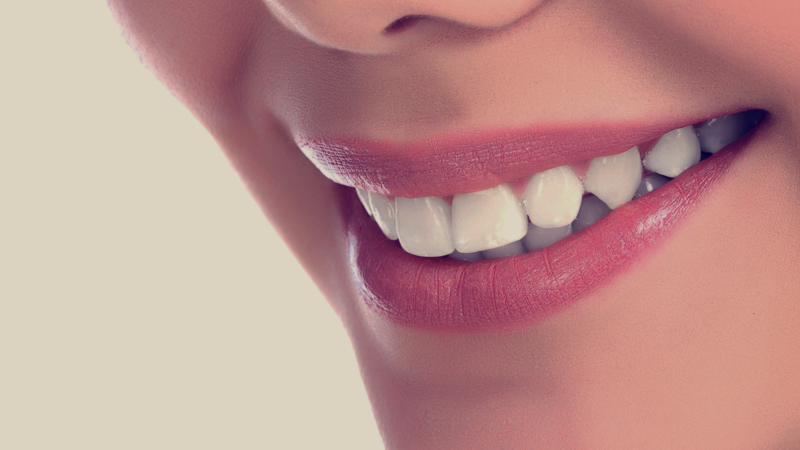 The dental implant system works much like the natural system that the body designed. 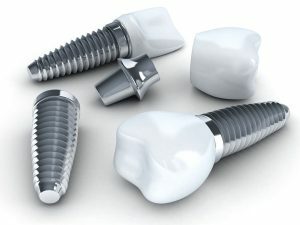 The dental implant itself actually refers to a special titanium screw-shaped anchor , which is inserted into the jaw bone. Once the implant has “integrated” into the bone, a fake white crown is attached to the implant, thus becoming a fake tooth. The dental lab will make dental crowns out of a durable porcelain that does not harm other teeth. In addition to this, the porcelain dental crowns look and feel exactly like your natural teeth, so nobody will ever even know they are there. What is the process and timeline of getting dental implants? Before you can get started, your gums need to be healthy, and your jawbone needs to be strong. If we identify any cavities or signs of gum disease, this will need to be treated first. The next step in the procedure is to have the titanium implant screw placed under the pink gum line. The metal post is secured to the jawbone in order to create a durable, synthetic root system that rivals the strength of natural roots. Over the course of a couple of months (3-6 months), the metal post and jawbone will fuse together, in a process known as “osseointegration”. This creates a level of durability that cannot be replicated in any other type of procedure. Once this period finishes, a new fake tooth will be attached to the implant screw. The new tooth is attached so securely that patients can eat their favorite foods, maintain an active lifestyle, play sports, and more, without fear of their tooth becoming loose or falling out. Patients enjoy the benefits that come from never having to worry about their tooth again. With any type of surgical procedure, it is important to visit an expert and by doing so you will reduce your risk of complications or the implants not functioning properly. Here, we take the time to make sure that every aspect of the procedure is completed correctly – the first time. How do I maintain my implant afterwards? Once implants have been installed, they are extremely easy to care for. In order to care for your implants, we advise patients to brush and floss their teeth throughout the day like they normally would. Additionally, it is important to schedule dental exams and cleanings at least twice a year. Our dentists will help to clean your teeth and ensure that they stay healthy. This step is incredibly important because while dental prosthetics can still trap bacteria around them if not properly cared for. If you currently have implants and your teeth start to hurt, let us know as soon as possible so we can take a look. This way we can identify any infection and treat it before it can spread into the jawbone. As long as you follow these simple preventative care steps, your implants and natural teeth should remain in good health. That depends on how many implants you are having placed. For the implant placement procedure, It can take up to an hour to place each metal implant. This is why if you are having a lot of teeth replaced, you may need to visit us several times. Once the metal post has been implanted, you will need to wait a couple of months (3-6 months) for the process of osseointegration to take place. This is where the metal and bone fuse together to provide a sturdy, synthetic root system for your new tooth. You will not feel anything while this is taking place but waiting is important to ensure that your final tooth is as durable as a natural one would be. Rushing this process will risk failure of an implant that is still not fully ready to be used. 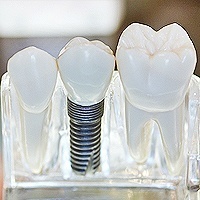 When ready, we will attach the new crown (tooth) to an abutment that is secured to your implant. This appointment will be much shorter. What is the recovery like after a dental implant procedure? We recommend that you prepare for recovery by preparing soft foods for eating. For a few days, your gums will be sore, so ice packs and ibuprofen will help to reduce any swelling, while eating soft foods will help to prevent discomfort. After a few days, you should begin to feel better and start to eat regular foods though you should still avoid anything sharp. Since there is a delay between when the metal implant is placed and when the new tooth is attached, we often provide our patients with a temporary denture to wear so that their smile appears intact while waiting for the procedure to be completed. Just like any medical surgery or device, there is always a slim chance for failure, and we do get questions about how this can happen. A failed implant is one that is loose, has pus, is painful, becomes mobile, falls out, or starts to show bone loss of more than one millimeter after the first year. In these cases, we want to make sure to identify and rectify the problem. If we start to see mobility in the implant or a bone loss of one millimeter after one year or 0.2 millimeters after the second year, we may start to discuss implant failure and what measures to take. It is important to note that if we find a low density of jawbone during surgery, we will consider adding a bone graft during before placing dental implants to ensure the bone can withstand the new implants. With a variety of implant brands, you may see commercials or advertisements for very cheap implants. This is an example of “too good to be true.” Implants or dental care that may appear very inexpensive are likely due to using poor quality dental implants. Such low quality products can lead to a much higher risk of implant failure or infection, costing you another trip to the dentist with likely require more surgery, money, time, and effort involved in rehabilitating your mouth. Why take that risk? Here at JPW Dental, we only use the best implant brands that are the among the global leaders in the dental implant industry and have gone through rigorous clinical trials to be approved for human usage. We believe in delivering high quality products to you to ensure you have the best chance of a long-lasting and healthy smile!